Day 4 of the 2011 Sydney International Boat Show. 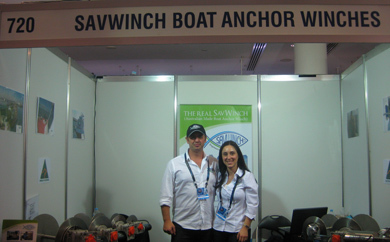 Nick and Eleni Savva, owners of Savwinch are exhibiting at the Sydney International Boat Show. The great weather has brought loads of people into the show with lots of interest being generated in our products. Boaters from NSW are less familiar with the drum style boat anchor winches and so this show has been more of an exercise in product awareness. Show visitors have shown a lot of interest in our boat anchor winches and are impressed by the main design advantages over other similar products on the market, including the low noise, being Australian made not just Australian assembled, corrosion resistant motor and gearbox components, bearings and bearing hub support and a 2 year warranty. The show finishes at 8pm on Monday 1st August, so if you can come and visit us at Stand 720 in the Promenade and see our winches up close.